MetroPaint is a free intuitive and quickly image and photo editing software for Windows. Lightweight and powerful, full of many great features. This Software is completely free, It does NOT change any system file, and the program itself does not requires installation on your system. 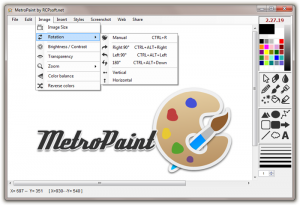 MetroPaint is a free intuitive and quickly image and photo editing software for Windows. You can also prevent users from being able to change the logon screen if you don’t want them to be able to modify it without administrator rights (option available by clicking on the “Settings” button). You can Edit, Open and Save all type of image files, jpg, png, bmp, gif and use all classic paint tools. With MetroPaint you can change image size, rotation, contrast, brightness, transparency, color balance, reverse color. MetroPaint can make Screenshots, view grid and rule, and effect style tools.